After tearing his ACL last August, Edelman again figures to be Tom Brady's main man in 2018. Edelman injured his right knee August 25, undergoing surgery four weeks later. He said at Super Bowl LII that his knee was "pretty healthy." The Boston Herald recently reported that Edelman is expected to be ready by training camp. So the bigger issue becomes a looming four-game suspension the wideout received for violating the league's performance enhancing drug policy (the appeal process is ongoing as we went to press). ... All that being the case, Edelman will be in prime position to pick up where he left off upon return -- especially with Brandin Cooks traded to the Rams. As ESPN.com's Mike Clay noted, whereas Cooks handled a 19 percent target share last season (7.1 per game), Edelman averaged a 27 percent share (9.9 per game) during the 2013-16 seasons. Even with ample depth at the position, Edelman should move right back into that lead role once the suspension ends. 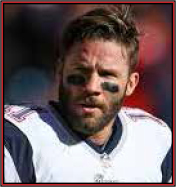 As the Boston Herald recently noted, Edelman stands as one of the game's most impactful slot receivers. He's been Tom Brady's most trusted go-to guy and one of the league's most productive receivers in recent years. So it's no surprise that Edelman had his usually productive season in 2016, playing in all the team's games and catching 98 passes for 1,106 yards in the regular season. The question is how much newcomer Brandin Cooks and the additions to the backfield (Rex Burkhead and Mike Gillislee) change game plans and/or cut into his targets. Herald staffer Karen Guregian pointed out that Brady still tends to look for Edelman whenever he's in trouble or he needs a play. So expect Edelman, who signed a lucrative contract extension in June, to have an ongoing role regardless of the changing personnel. Indeed, it's safe to say Cooks' arrival will even drive Edelman's price down to some degree. Don't be afraid to jump in and take advantage of that value, especially in PPR leagues.